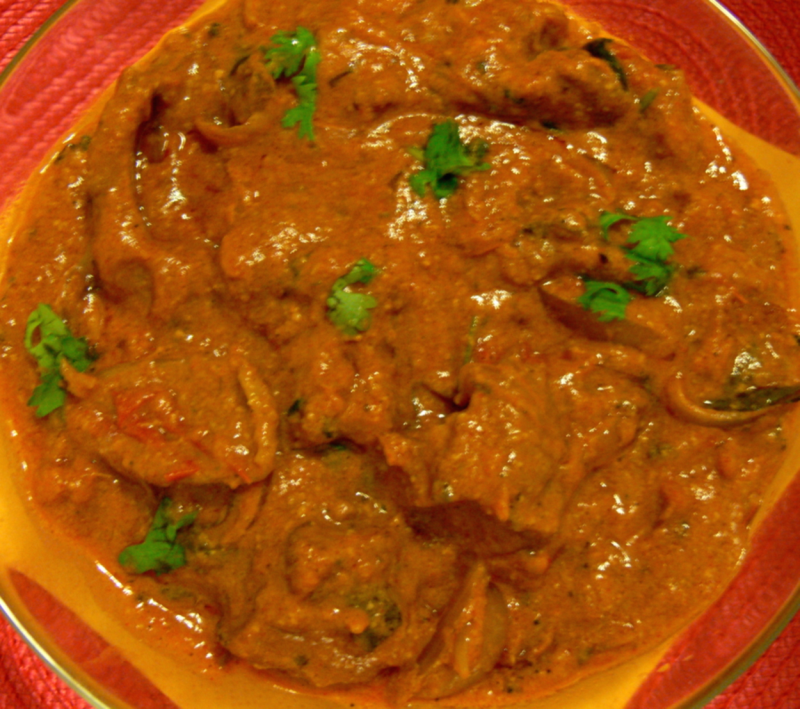 Very tasty Mutton dish with thick and tangy gravy.Here is the treasured recipe for u to try at home. Happy Cooking!. Heat 2 tbsp oil in a pressure pan and shallow-fry the marinated mutton pieces for 6-7 mins on medium flame till half-done.Take the mutton pieces and keep it aside. Heat 2 tsp ghee in the remaining oil,saute the chopped onions and curry leaves(optional) till it turns golden brown. Add jeera powder, shahjeera seeds and chopped tomatoes with 1 tsp salt(adding salt here speed-up the cooking of tomatoes) and saute this till the tomatoes begin to melt. Add ginger paste and garlic paste,saute this till the rawness goes. Then add green chillies,coriander powder and chilli powder and saute well for 2 mins. Now add the cashewnut masala and saute for 3 more mins. Add the shallow-fried mutton pieces and stir for 10 more mins. Then, add 150 ml water and the coriander leaves.Mix this well.Pressure-cook this upto 2 whistles.Turn off the flame.Leave this for-a-while till the pressure releases. Garnish with few coriander leaves.Serve this tasty mutton curry hot with rice or Indian breads. Hi @Jean,Its good to hear from U.Thanks for dropping in.Yes I'm in India and visiting my husband few times a year.Visit my foodblog http://mykitchenflavors-bonappetit.blogspot.com/ when time permits.Thanks again. This was really good. Thanks. Glad to note you have returned to India (there's no place like home, I've lived in East African countries for almost 30 years and travelled in Europe, US and Far East) so do look forward to many more great recipes. Best wishes. Thanks a lot Subhash and Mayask. Hi! Christy thanks for the wonderful and delicious recipes; i have try almost many of your recipes and it came out very tasty. Dear Christy and Raje .... Welcome back . I'm so happy to see U guys . I may not know U but I love all your Wonderful recipes . Thank U . WINNERS NEVER QUIT AND QUITTERS NEVER WIN . Thank u So much Mayask. Actually u (are one of the few who) made me come back.Visit my foodblog http://mykitchenflavors-bonappetit.blogspot.com/.Thanks. Hi ! Christy ....Nice Pic and nice recipe. Thank U . Meat is a good source of Niacin, Iron , Phosphorus and Zinc . Also rich in Protein , Vitamin B12 and Selenium . Please,the cumin powder added should be 3/4 tsp and chilli powder to be 1 1/2tsp. Yumm with simply tempting gravy that can pair up with all Indian breads.Try this one.